The Creative Colors Int. Franchise is an Ideal Business! CREATIVE COLORS INTERNATIONAL, INC. started in July 1991 through its affiliate J & J’s Creative Colors, Inc. J & J’s Creative Colors began business in 1980 dyeing, repairing, and restoring leather, fabric and vinyl, plastics, and fiberglass. Currently there are 18 mobile units in operation servicing the Chicagoland and surrounding suburbs. There are many other markets that have remained untouched and will be the focus of J & J’s expansion in the years ahead. These markets are to include restaurants, hotels, motels, government facilities, and hospitals. OUR FRANCHISE SUCCESS STARTS WITH OUR LEADERSHIP TEAM. We are fortunate to have one of the most experienced leadership teams in franchising. It is under their guidance that we have had and continue to see our great successes. 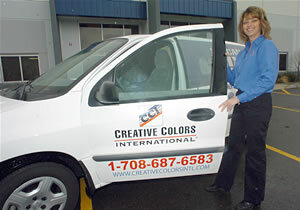 CREATIVE COLORS INTERNATIONAL, INC. is a company where a family atmosphere is instilled in each franchise. We portray our family style business to our franchisees so that they will use these values in growing their own business. Quality and service is the future of our industry and we strive continually for both at C.C.I. Our franchise system currently has 68 locations including our affiliate and company owned locations. We offer our services in the following states: Arizona, Arkansas, California, Colorado, Florida, Georgia, Illinois, Indiana, Iowa, Kentucky, Louisiana, Michigan, Mississippi, Missouri, New Jersey, North Carolina, Ohio, South Carolina, Virginia, and Wisconsin. We also operate in London, Ontario, Canada. A total of 125+ mobile units are providing these services throughout the U.S. and Canada. We will continually expand each year adding new franchises each year until we reach our saturation point of 500 franchisees in the United States. All franchises have an exclusive territory containing all markets for continued growth. Each franchise develops their territory by adding mobile units to provide services. The continued growth is built through name recognition, quality, and service. Through their own motivation and desires, a rewarding business is built for themselves and their families. Our concern for the individuals extends to our customers too. We may know that we are better than our competition, but we are really no better than the treatment we give our customers.